To me, being creative is something that has become second nature. It is now like breathing or blinking to me. I just have to create. I’m not saying all of it is good, but I just have this, almost instinctive, desire to constantly create things. It has actually been that way for a very long time. As far back as I can remember, I always wanted to ‘put on a show.’ I can remember recording the audio from cartoons off of television and then rounding up neighborhood kids and putting them through rehearsals to act out the cartoons in front of our parents. When mom and dad would have friends over I would organize the kids to do a lip sync number or something and then drag all the parents to watch it at some point in the evening. As a kid I also loved to draw, though I was never any good at it. I’m still not but I continue to do so anyway. I also loved to sing along with records and strum on plastic guitar (though I didn’t know any chords). I was just always trying to think of someway to entertain people. I was very lucky. My parents encouraged all this. Sure, they would have liked me to focus a little more on my studies and less on drawing or writing, but they never told me I couldn’t pursue these passions. As I reached high school and started getting involved in theatre and band, they became very involved. Mom in the Drama Boosters and dad building sets for the shows. Again, I know exactly how lucky I am to have had that support and that is largely responsible for why creating is so important to me now. At the beginning of 2012, for some odd reason, I just started posting daily Facebook posts and Tweets on Twitter that shared a short thought on some aspect of creating. I would sometimes sit down and think of them for the week or sometimes I would just go day after day coming up with one for each day. These daily postings seemed to catch on with people resulting in a lot of ‘Likes’ and ‘ReTweets.’ People would message me privately and let me know the little quotes were inspiring them to be creative in their daily lives and one person even wrote that because of these daily postings, they had left their full time job, partially, to pursue a creative career. Whoa, that’s heavy. After a couple of weeks of these daily postings, I started to run dry. I had been keeping good track of them, but all the new thoughts I was coming up with were either duplicates of or very similar too ones I had put out earlier, so I stopped. But, as I said, I was keeping good track of them and the thought hit me to take each little thought and then write a three hundred to five hundred word piece on each of them and release them on this blog every Monday. My goal is to do this for a whole year so that by the end of 2014 I’ll have 52 short pieces on different aspects of creativity. I already have fifteen written, not including this intro post, so it’ll continue for fifteen weeks at least. I would really love this to become something interactive as well. 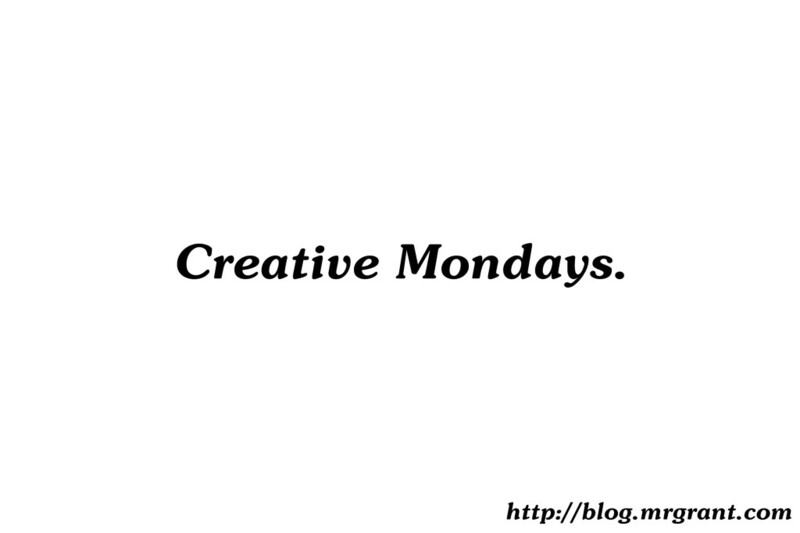 I’d love to hear your feedback on this “Creative Mondays” project as a whole and the weekly posts when they come out. Also, if you feel so inclined, I welcome you to share these posts with anyone you feel would enjoy them. Also, at the end of each piece I will post a question or prompt and I’d love for you to post your response in the comments below. Feel free to interact with other readers as well. Though creativity is not a decisive tops, I ask you please keep discussion civil and supportive. Comments will be moderated. Let’s get a really good creative discussion going! See you next week for Creative Mondays #001! Introduce yourself and tell us what your main creative passion is. (Writing? Drawing? Painting? Sculpting? Woodworking? Digital art? Etc.) Tell us in the comments below!